Pretty hand painted porcelain girl figurine by Enesco. #12 blonde birthday girl from the growing up girl series. 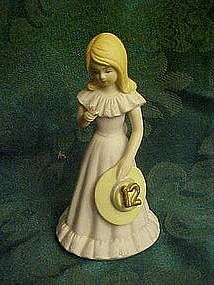 She is 5 3/4" tall and has the #12 in gold on her hat she is holding. She would be perfect but there is a small chip off her rose she is holding. Could be easily touched up. (see photo #2).Dated 1981.